This title contains proven techniques for building a strong investment portfolio - whether you are 25 or 55. If you're like most people, you could do better when it comes to investing your money. "The Standard & Poor's Guide for the New Investor" shows you how to lay a solid investment foundation designed to become a lucrative, lifetime financial plan, all while keeping enough money set aside to enjoy yourself along the way. 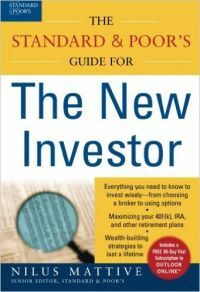 Combining solid research with insightful, real-world analysis, this no-nonsense book discusses: How stocks, bonds, and mutual funds work - plus how to make them work for you; techniques for getting the most long-term benefit from 401(k)s, IRAs, and other retirement accounts; and, all-weather strategies for building wealth in bull markets - and protecting that wealth in bear markets.It's never too late to begin managing your money more effectively. Wherever you are in your life and career, let "The Standard & Poor's Guide for the New Investor" show you how to get your arms around your finances today - to start building a financially strong tomorrow. Standard & Poor's Press brings the impressive knowledge and resources of "Standard & Poor's" to some of today's most challenging financial issues. Other results-focused books in the series include: "The Standard & Poor's Guide to Saving and Investing for College"; "How Charts Can Help You in the Stock Market"; and "The Standard & Poor's Guide to Long-Term Investing". Nilus Mattive is an editor for the Standard & Poor's newsletter The Outlook and is responsible for the Web-based Outlook Online. Mattive has written for a number of financial websites, including a long-running Web-based column for Individual Investor .